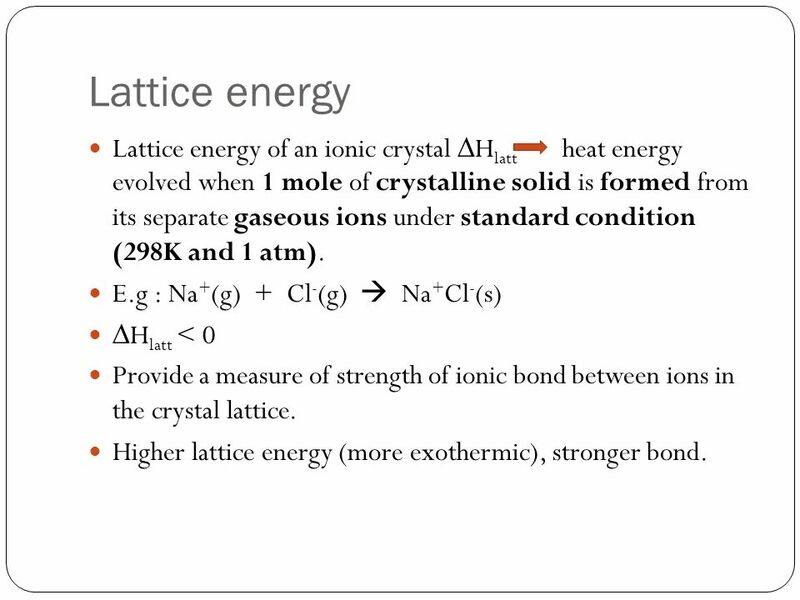 2 Lattice energy Lattice energy of an ionic crystal Hlatt heat energy evolved when 1 mole of crystalline solid is formed from its separate gaseous ions under standard condition (298K and 1 atm). 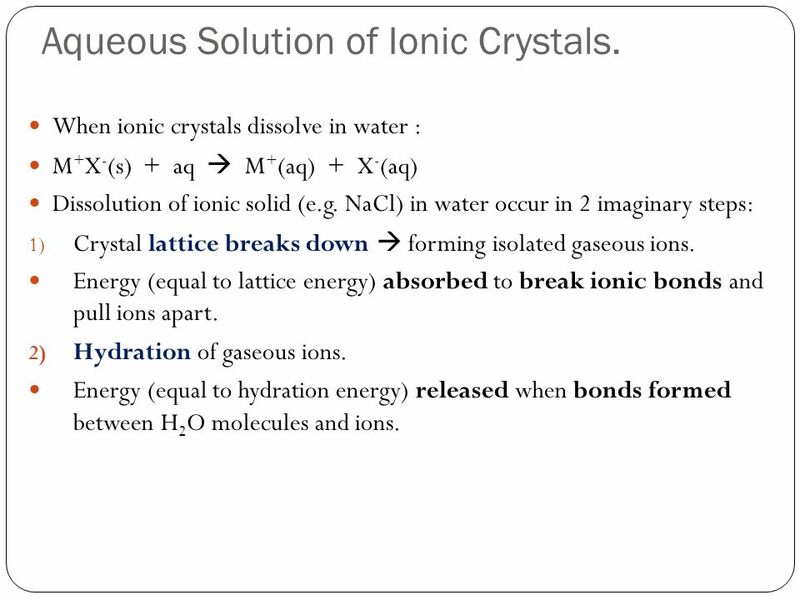 E.g : Na+(g) + Cl-(g)  Na+Cl-(s) Hlatt < 0 Provide a measure of strength of ionic bond between ions in the crystal lattice. 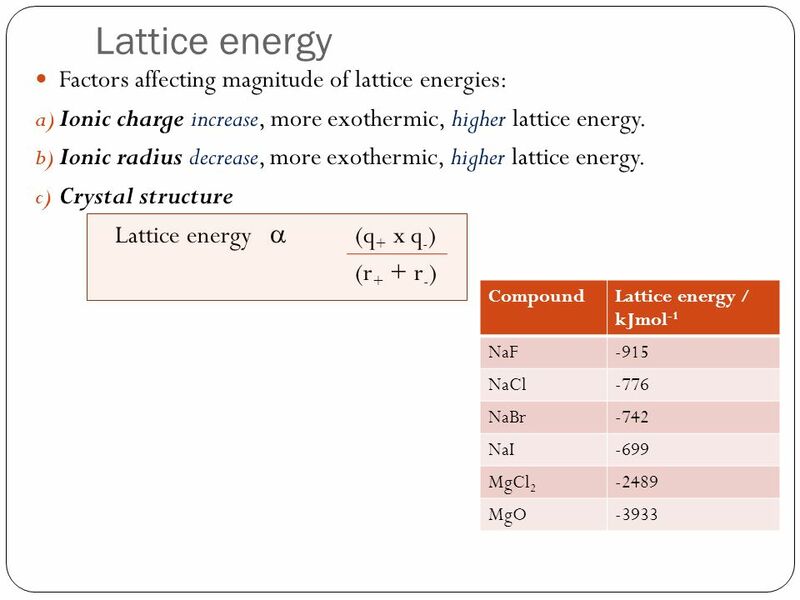 Higher lattice energy (more exothermic), stronger bond. 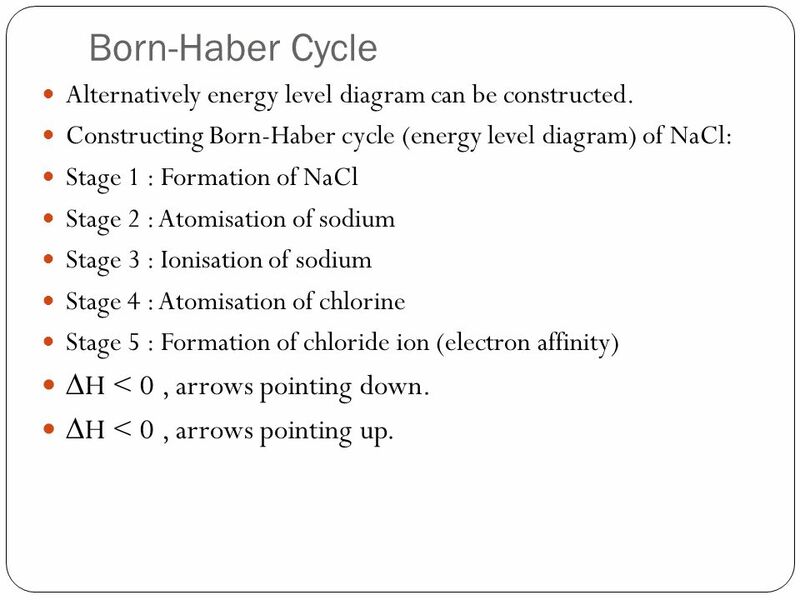 6 Born-Haber Cycle H < 0 , arrows pointing down. Alternatively energy level diagram can be constructed. 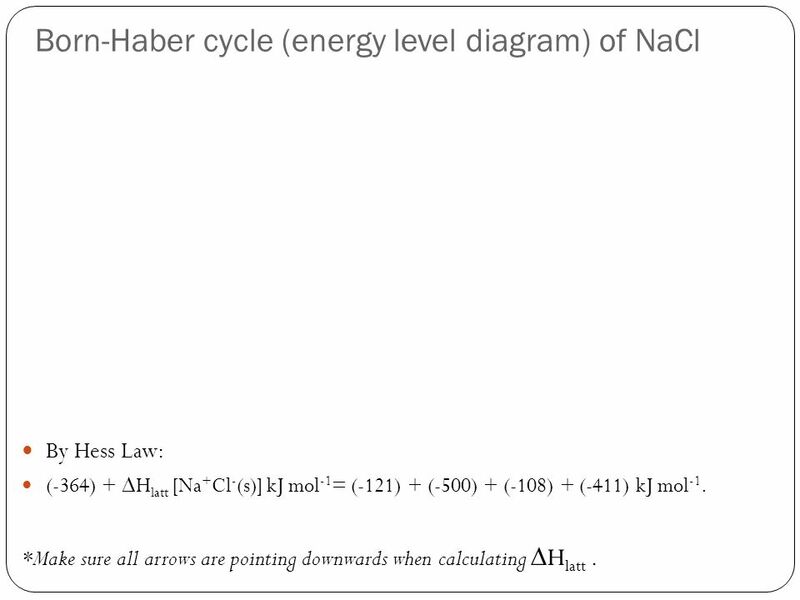 Constructing Born-Haber cycle (energy level diagram) of NaCl: Stage 1 : Formation of NaCl Stage 2 : Atomisation of sodium Stage 3 : Ionisation of sodium Stage 4 : Atomisation of chlorine Stage 5 : Formation of chloride ion (electron affinity) H < 0 , arrows pointing down. H < 0 , arrows pointing up. By Hess Law: (-364) + ∆Hlatt [Na+Cl-(s)] kJ mol-1= (-121) + (-500) + (-108) + (-411) kJ mol-1. *Make sure all arrows are pointing downwards when calculating ∆Hlatt . 8 Aqueous Solution of Ionic Crystals. When ionic crystals dissolve in water : M+X-(s) + aq  M+(aq) + X-(aq) Dissolution of ionic solid (e.g. NaCl) in water occur in 2 imaginary steps: Crystal lattice breaks down  forming isolated gaseous ions. Energy (equal to lattice energy) absorbed to break ionic bonds and pull ions apart. Hydration of gaseous ions. Energy (equal to hydration energy) released when bonds formed between H2O molecules and ions. 9 3 methods to calculate ∆Hsol. 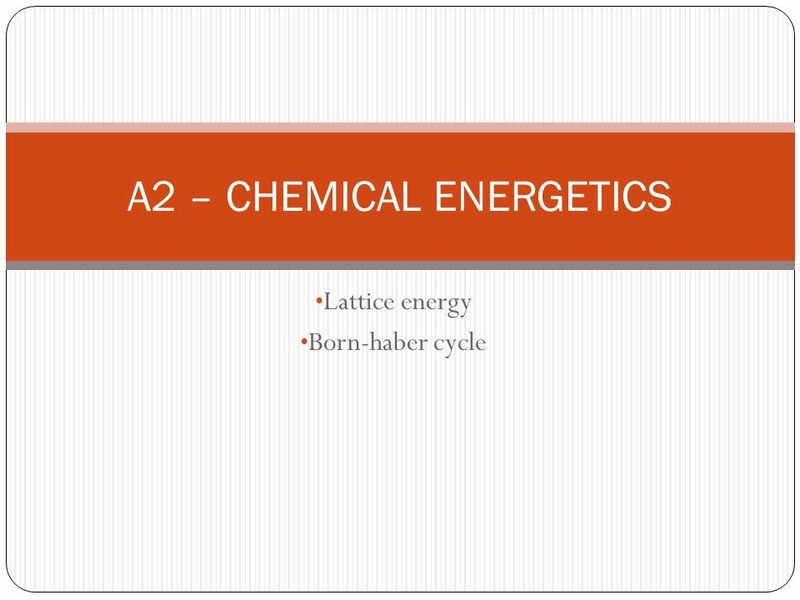 Download ppt "A2 – CHEMICAL ENERGETICS"
Chemical Bonding Compounds are formed from chemically bound atoms or ions. Bonding involves only the valence electrons. CI 4.5 Energy changes in solutions Why do some ionic substances dissolve in water, whilst others are insoluble? If there is enough energy to separate. Enthalpy Changes in Solution Ionic Compounds. 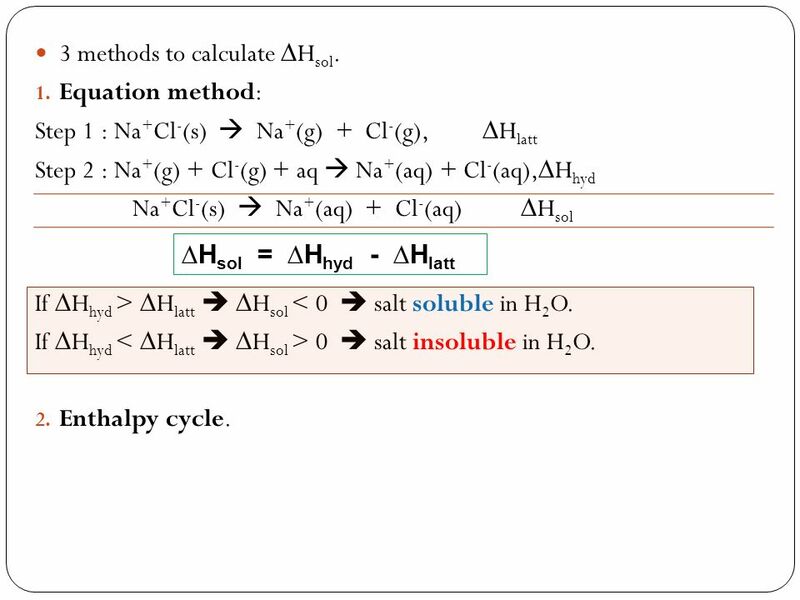 Enthalpy Changes in SolutionSlide 2 of 7 Enthalpy of Solution Definition –The enthalpy change that takes. 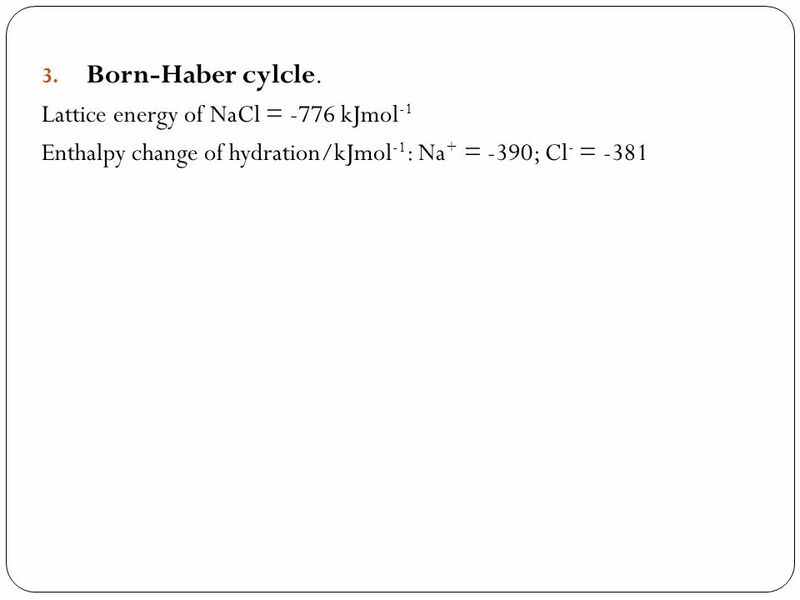 BORN-HABER CYCLES A guide for A level students KNOCKHARDY PUBLISHING 2008 SPECIFICATIONS. 5.1 Exothermic and endothermic reactions If a reaction produces heat (increases the temperature of the surroundings) it is exothermic. If a reaction produces. 15.2 Born-Haber Cycle Define and apply the terms lattice enthalpy, and electron affinity Explain how the relative sizes and the charges of. Chemical Bonds: the attractive (intramolecular) forces, ie.“ the glue”, strong enough to maintain a group of atoms together for an indefinite amount of. 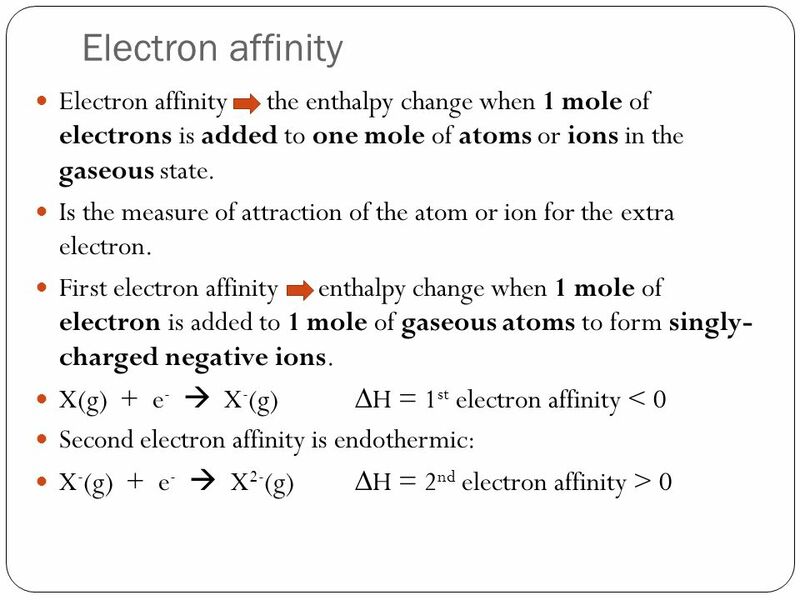 Enthalpy Change of formation is the enthalpy change when one mole of a compound is formed from its constituent elements under standard conditions. Enthalpy. YR 11 DP CHEMISTRY ROB SLIDER 15 ENERGETICS (AHL). 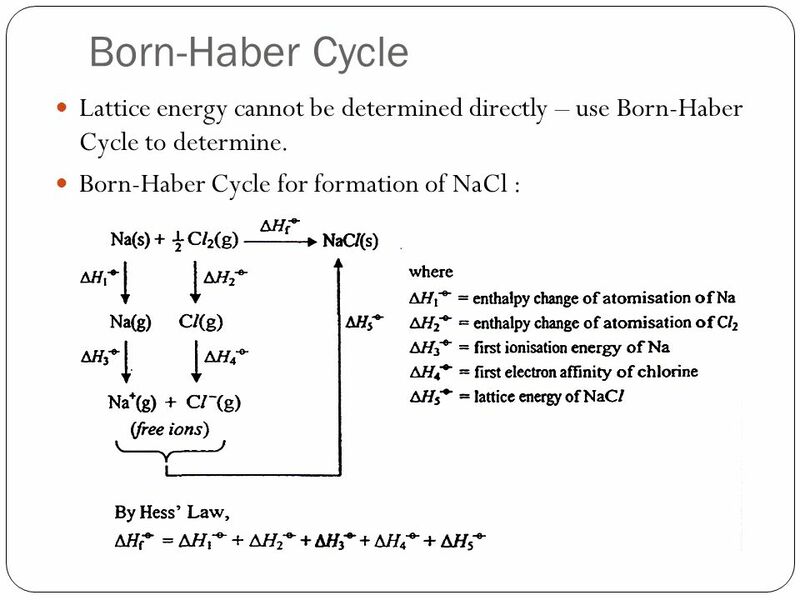 Title: Lesson 6 Born-Haber Cycles and Lattice Enthalpies Learning Objectives: – Understand the term lattice enthalpy – Use Born-Haber cycles to calculate. Formation of Binary Ionic Compounds Binary Ionic Compound n Binary- two n Ionic- ions n Compound- joined together. Ionic Bonding. Metal atoms with low ionization energies and non-metal atoms with high electron affinity form cations (+) and anions (-) Oppositely charged. Example Calculate the reticular energy for LiF, knowing: Li (s) + ½ F 2(g) LiF (s) ΔH° kJ Applying Born Haber’s cycle, the formation of LiF is. For an ionic compound the lattice enthalpy is the heat energy released when one mole of solid in its standard state is formed from its ions in the gaseous. 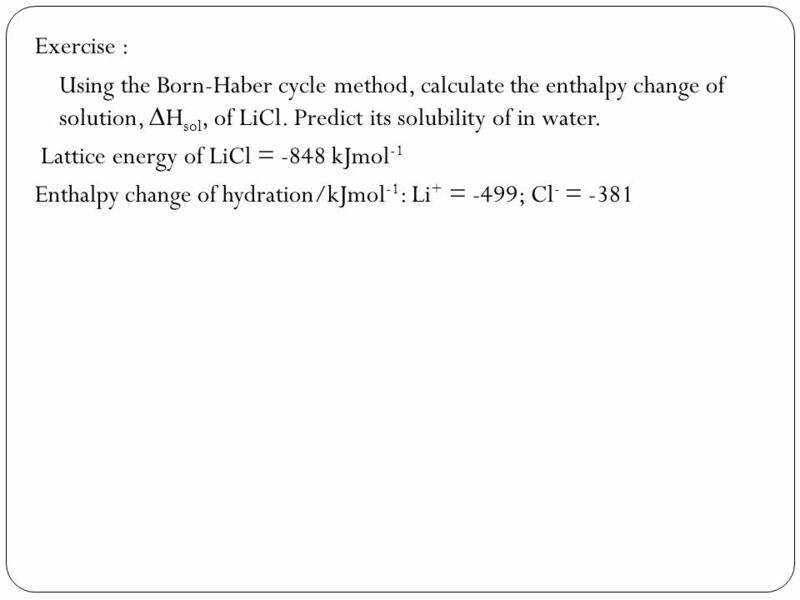 Example Calculate the reticular energy for LiF, knowing: Li (s) + ½ F 2(g) LiF (s) ΔH° - 594.1 kJ Applying Born Haber’s cycle, the formation of LiF is.